This is a shirt that was created by Ashley Perrin. Ashley reached out to Strong Athletic to see if we could make her this custom shirt, once other people in her community got word of the shirt, we were flooded with requests to make it for the public. With Ashley's blessing we did so. $1 from each shirt sold will go to American Autoimmune Related Diseases Association. 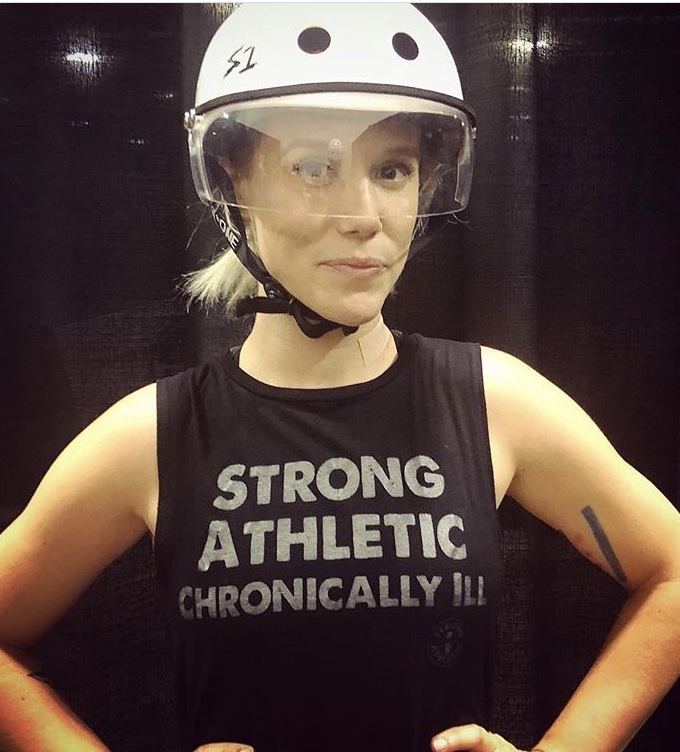 Why make a shirt that says "Strong Athletic Chronically Ill"? There are millions of humans who live with "invisible" illness, many of whom are athletes. These illnesses are called invisible because they are not necessarily obvious to others. Some people with these illnesses go years without being diagnosed and they are thought of as apathetic, lethargic, low-energy, over weight, clumsy, absent minded or worse. Even with diagnosis, life doesn't necessarily become easier. The entire world was designed for people who do not need assistance to walk, see, hear or function in the world. In sports and athletics it's the same, if not worse. Most sports were not designed with accessibility in mind. Athletes living with chronic illness not only have to train hard to compete, but they also have to do everything that they can to stay healthy. Sometimes they have to take time off of their sport involuntarily due to illness. This can be heartbreaking to have to "push pause" on their dreams, forcing them to spend time away from teammates and their community they rely on and are a part of. Strong Athletic owner Nadia Kean has coached thousands of athletes, and she finds that despite the limitations that life places on so many different people with so many different personal situations, humans are able to thrive with persistence and passion. It's not always like the stories from the movies, where in the end the athlete gets better and gets to compete, but sometimes that is the story line, and it's glorious. Strong Athletic was very honored to be asked to make this shirt. If you are part of a community that would like to collaborate with Strong Athletic and represent who you are and what you stand with, please reach out.